Pure Polyurea is a high performance, sprayed, plural component elastomer exhibiting excellent physical properties. Polyurea is based on amine-terminated polyether resins, amine chain extenders and prepolymers. Polyurea provides an extremely flexible, resilient, tough, monolithic membrane with excellent water and chemical resistance. Polyurea has an extremely long service life. Independent tests commissioned by the Bechtel Corporation indicate at least 75 years. Polyurea water containment is presently being built on the Hanford Nuclear Reservation Tank Farm to avoid environmental catastrophe. The tank farm has approximately 172 nuclear waste storage tanks holding more than 50 million gallons of highly radioactive waste materials. Polyurea is chosen to accomplish the most critical water containment projects in the world. Polyurea has a high puncture & impact resistance far exceeding EPDM liners. Refer to military tests & implementation of Polyurea as a medium for blast mitigation. Polyurea HI-E exhibits 700% elongation which allows for various ground movement, such as, swelling, subsidence, seismic activity & freeze/thaw cycles. When combined with geo-textile fabric & applied to the support structures it adds strength & ties together the entire surface. This elongation potential effectively mitigates the damaging effects that concrete is so prone to. Polyurea affords a completely seamless water proofing barrier which will prevent leaching in either direction from support structures such as concrete & chemically treated wood. See thumbnails below. Polyurea liners are built, in situ, as a continuous unit, creating one continuous molecular chain. The completed Polyurea liner is a single piece, an example of monocoque construction. This seamless construction, with Polyurea’s extremely low rate of permeability, effectively seals water from all submerged structures such as docks, pillars & islands. As a result, these structures will not be impacted overtime by the effects of water. This level of protection results in decreased or non existent long term maintenance. EPDM liners require cutting & seaming around shapes & underwater structures. This cutting & seaming compromises the long term water tight integrity while relying on the glue bond of each seam to determine the life of the liner. Polyurea is seamless. Beach sand surfaces can be permanently affixed. 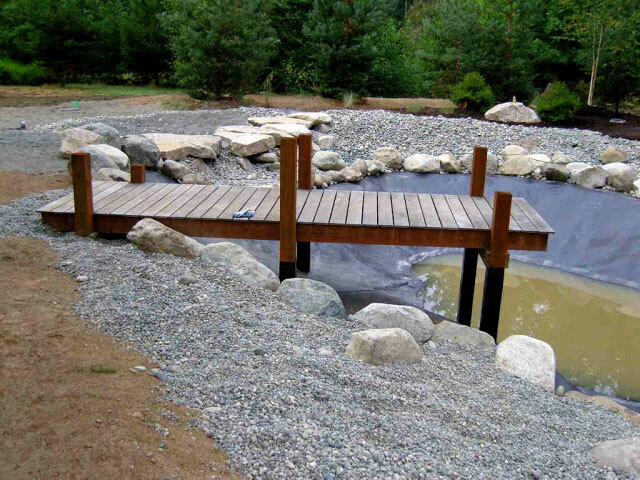 Sand & gravel may be broadcast into the polyurea immediately upon curing for a natural sand finish. A Polyurea liner requires much less concrete for structural support than EPDM liners because the floor of the project can be bare ground lined with Polyurea applied to geo-textile fabric. These liners have been laboratory tested & found to yield tensile strength values averaging 2500 psi. 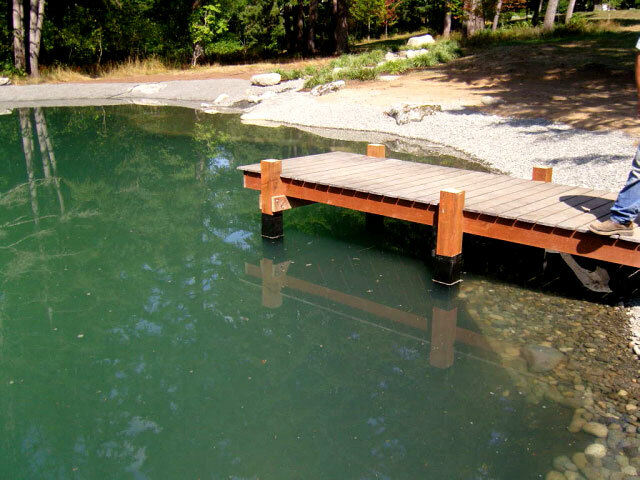 Concrete naturally leaches into the water increasing both PH & alkalinity over months & possibly years. In live water systems this must be dealt with to maintain health & water quality standards. Polyurea effectively isolates the cement with an inert, impermeable membrane. As you can see, Polyurea is used to create seamless and waterproof barriers for support structures, such as concrete & chemically treated wood.